We have prepared a paper on Cycling in Newham. It starts with evidence to show that Newham lags behind other boroughs in reducing traffic accidents and public health; and its long recognised high potential for cycling has not been realised. It seeks the adoption of an effective cycle strategy to underpin a coherent approach – giving priority to walking and cycling over motor traffic. The paper provides examples where past and current deficiencies in this regard have exacerbated our road safety and health problems. The attached was distributed at last night’s Local Group forum meeting. Â The launch of the campaign is 22nd July, with the intention of handing over the petition to the Mayor on 1st September. Â Once the campaign goes live, please spread the word! At last night’s meeting, Olawale took us through the discussions he has had with Tower Hamlets Wheelers, taking into accountÂ LCC’s standards for junctions. 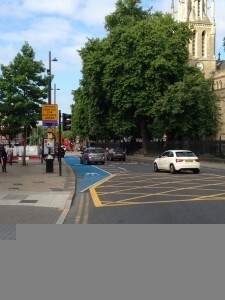 Â His draft response and sketch map are attached to this post, as well as an article on Cycle Segregated Junctions from the last issue ofÂ London Cyclist. This is an important issue and although it is only an interim measure, it is important that we push TfL to get it right. We will be submitting a response on behalf of Newham Cyclists, but individual responses are probably more important. Please make sure you have your say! 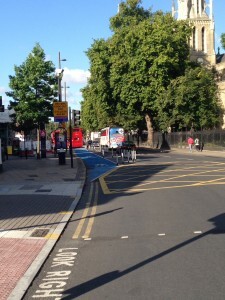 Stratford Gyratory is a key cycling node. 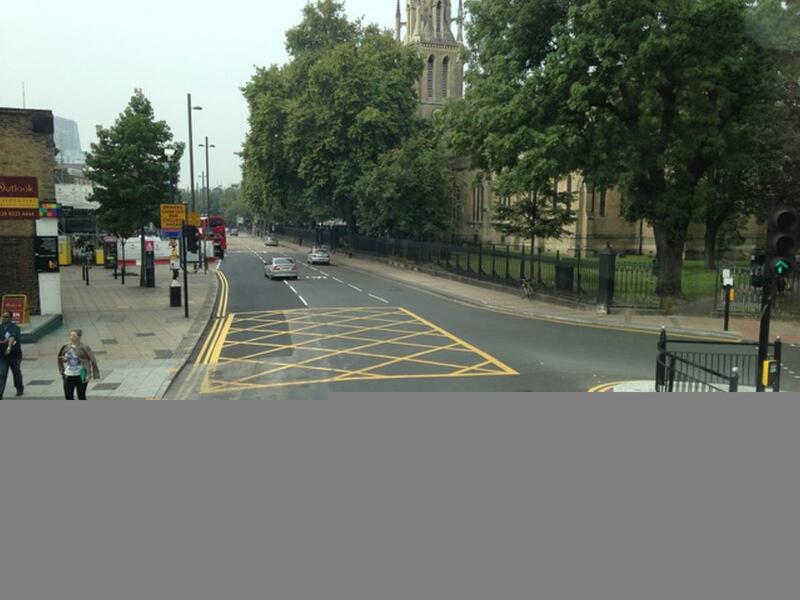 Â More than Â£1m is available for design and consultation of a new junction. Â Here are the principles we are working on for its improvement from the cycling angle. This link will open a drawing (whichÂ will need rotating clockwise). The main axis for motorised traffic would be Stratford Broadway through to the Grove i.e. the A11. Stratford Broadway to be bi-directional with segregated cycle lanes forming part of CS2 (on existing westbound carriageway). A subsidiary traffic axis Â from Leyton Rd /Â Angel lane through to Great Eastern RdÂ (eastern section to the Grove) to be single single bidirectional lanes with Â cycle tracks and bus islands. 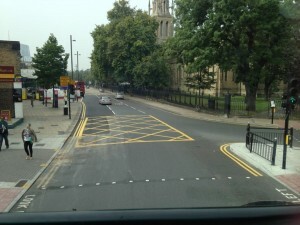 Eastbound, one way bus, taxi, delivery and cycle traffic only on Great Eastern RdÂ from the “Rhubarb” sculpture to Angel Lane, with cycle contraflow. This leaves (essentially) a series of Â T junctions (at (1)the “Rhubarb” sculpture), (2)Tramway Ave/Broadway, Broadway/Romford Rd, Â (3) Grove/Great Eastern RdÂ (4) Angel Lane/Great Eastern Rd.) These to have, in principle “hold left” arrangements to prevent left hooks and attractive options for cycles turning right. Additional cycle parking at convenient points with large footfall. Maintain and, in some areas Â improve, existing facilities e.g. at pavement level on the Grove, the Grove Crescent contraflow, Oxford Rd, the eastbound bus lane in the Broadway. This form of design would bring huge public realm gains including the link between the Stratford Centre to Westfield; permit the repositioning of crossings and bus stops to more convenient locations; and reduce conflicts between pedestrians, cyclists and motor traffic. If you haven’t already signed the Space for Cycling petition, please make sure you do. Â At the time of writing this, only 59 people from Newham have signed, so please add your name and spread the word! Many of you, like me, will use CS2 on a daily basis to get to work. 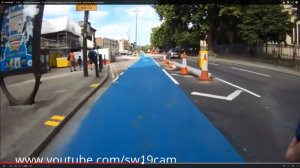 Over the past few months, there have been a ridiculous number of changes to the start of CS2 at Stratford Broadway, coming full circle back to exactly where we started. This just isn’t acceptable. Not only is it hugely dangerous to keep changing the road layout so that no road user has any idea what they’re doing, but the cost of all these changes must be incredible. Arnold has already emailed Councillors Crawford & Christie and submitted a Freedom of Information request, but it may be that this is something that we really want to push as a group. Please let us have your thoughts by commenting below. Here are some photos documenting the changes as well as a short video.